It is furthermore well known that many people indulge in habits that result in undesired effects. As the instigators of the great anti-capitalistic campaign see it, the bad taste and the unsafe consumption habits of people and the other evils of our age are simply generated by the public relations or sales activities of the various branches of “capital”,— wars are made by the munitions industries, the “merchants of death”;dipsomania by alcohol capital, the fabulous “whiskey trust,” and the breweries. This philosophy is not only based on the doctrine depicting the common people as guileless suckers who can easily be taken in by the ruses of a race of crafty hucksters. It implies in addition the nonsensical theorem that the sale of articles which the consumer really needs and would buy if not hypnotized by the wiles of the sellers is unprofitable for business and that on the other hand only the sale of articles which are of little or no use for the buyer or are even downright detrimental to him yields large profits. For if one were not to assume this, there would be no reason to conclude that in the competition of the market the sellers of bad articles outstrip those of better articles. The history of money doesn’t need to be confined to one specific country or time period. It is rather expedient to outline the role money has played and the changes it has gone through in virtually all countries over time. Some events might have occurred earlier or later in one nation or another. However, the general trend to date has been the same. Understanding this trend is of major importance when it comes to understanding money today. This article describes the imaginary story of a country that went from no money at all to a fiat money, paper money. It is conceptually applicable to any country on earth. The demand for money arose with the appearance of division of labor, when individuals began producing for others rather than for themselves. This was of course a direct outcome of the law of comparative advantage and the corresponding specialization of labor. If individual A transforms land and produces a good that individual B demands, but B has nothing to offer that A demands for consumption, A might still consider receiving a product M in exchange that he can then give to individual C. C happens to demand B’s product for consumption AND offers something that A also demands for consumption. In this case, from A’s point of view M is a medium of exchange, a money. With division of labor spreading, different goods would be used as money, such as tea, coffee, beans, salt, or cattle. There are numerous accounts of the usage of these goods as money in history. However, there are goods that are better and goods that are worse than others for usage as a medium of exchange. A medium of exchange needs to fulfill criteria such as durability, divisibility, homogeneity, measurability, sufficient but limited availability and broad acceptance. The metals gold and silver emerged as goods that best fulfilled these criteria when used on the market. Consumers, entrepreneurs, capitalists, landowners, and workers dug up and/or used gold and silver as money in exchange and credit transactions on the market. Decentralized, competing gold mines would channel gold into the market, part of which was used as money. For a fee, some entrepreneurs began offering the service of depositing money in warehouses, also known as deposit banks, so the owners of the money wouldn’t have to carry it with them. They would issue receipts for the money deposited. Soon the receipts themselves, rather than the deposited gold, would be used as money, hence gaining value as media of exchange. Some of the gold would not be redeemed but rather stay in the warehouses. Thus the entrepreneurs issuing the receipts started offering their own receipts in exchange and credit transactions which were not backed by their own gold. However, they had to be careful not to issue too many uncovered receipts. Because as the price of their additional receipts would drop, their customers would begin redeeming them in exchange for gold again. If there were too many uncovered receipts issued, the warehouse would ultimately lose all its deposits and hence go out of business. Thus in the long run those deposit banks who managed their deposits most prudently would be the most successful and profitable ones. But some of the depositors had loaned receipts to the government and hence accumulated public debt. When they faced the threat of going out of business, due to a massive drain upon their gold reserves they sought help with the government. The government used its police force in order to prevent the deposit banks from having to redeem their customers’ receipts for gold. It declared the receipts of the banks a legal tender, which means that they became a fiat money, a money that people are forced to accept or face government force if they don’t. The operations of different banks were consolidated within one central bank and numerous fractional reserve banks with the exclusive authority to produce fiat money. In addition, the government forcefully confiscated private gold holdings and declared private ownership of gold illegal. This central bank was no longer under the constraints that the deposit banks used to face. It didn’t depend upon gold deposits and it could inflate the money supply at will. Without voluntary competition within the country, the result was that the quality of the money produced was low. Inflation became a common phenomenon. Just as seen in the example of the production of cars in the Soviet Union, the more monopolized and centralized the production of a good, the less competition exists, and the less the consumer is given a choice, the lower the quality of the good produced will be from the point of view of those consuming the good. Roughly, this has been the History of Money and Banking in the United States and the course of events that led to the establishment of the Federal Reserve Bank. A government operates under constraints that are different from that of an entrepreneur. The entrepreneur has no choice but to satisfy his consumers by withdrawing from the market factors of production whose output, directly or indirectly, currently satisfies fewer consumers than they are looking to satisfy or currently satisfies less urgent needs than they are looking to satisfy. The profit they reap is a result of the improved allocation of these factors of production. A government obtains goods in a different fashion. It needs to obtain them via taxation, which is in last resort an act of theft against the individuals within its territory. But individuals in general resent acts of aggression. In the long run a government can’t just send its police to collect taxes under no pretense whatever. Violent upheavals by the governed and subversion would inevitably ensue after some time. This holds true for a dictatorship as it does for a democracy. In order to justify its acts of aggression a government needs the consent of the majority of the governed, it needs public opinion on its side. Throughout history governments across the globe have always appealed to fear of foreign enemies to justify its necessity. But in addition there have been subtleties in other areas: In ancient days government leaders would be anointed by the clerical class which had the greatest influence on public opinion. During the age of enlightenment, with the appearance of capitalism, the idea of using government to protect private property and individual liberties became popular. When in the 20th century the concepts of socialism conquered the hearts and minds of the broad majority, the idea of complete government control of the factors of production had become unstoppable and was swiftly put into practice virtually everywhere in the world. When the attempts of socialism had proven impracticable and lead to the collapse of the Soviet Union, the ideas of interventionism convinced the peoples of the world of the necessity of government bureaucracy. Minimum wage, centrally planned welfare programs, fiat money and subsidies for special industries became the norm. Thus the main constraint for a government is the approval for its actions by the majority of the people. It will always do its best to mold public opinion to the extent possible. So long as it confines its activity to the protection of individuals against aggression and theft no major harm is caused. As soon as it begins to embark upon broader expansions of its bureaucracy, those who are governed by it need to be ever more vigilant and doubtful. If there has been one consistent trend in economic developments in the United States over the past 60 years it would be the growth of the size of federal, state, and local governments in relation to the private sector. 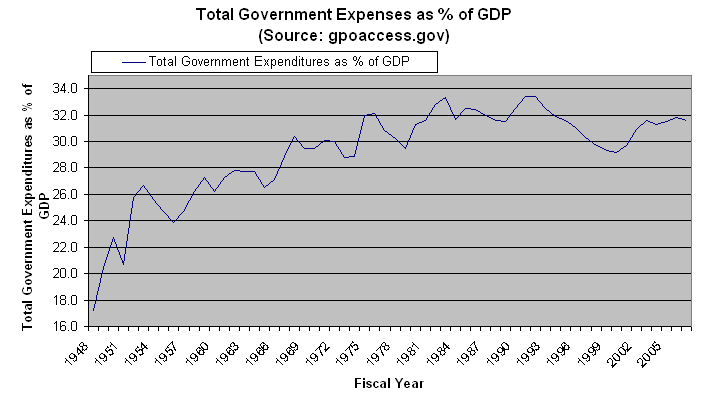 As can be seen in the first chart above, government expenses as % of GDP in the US increased from 17.2% in 1948 to 31.5% in 2007. The second chart shows that taxes rose from 21.7% to 29.2% in the same period. What is noteworthy that there was a brief period (1992 – 2000) where federal, state and local governments as a whole managed to cut its expenses as compared to the private sector from 33.4% to 29.2%. 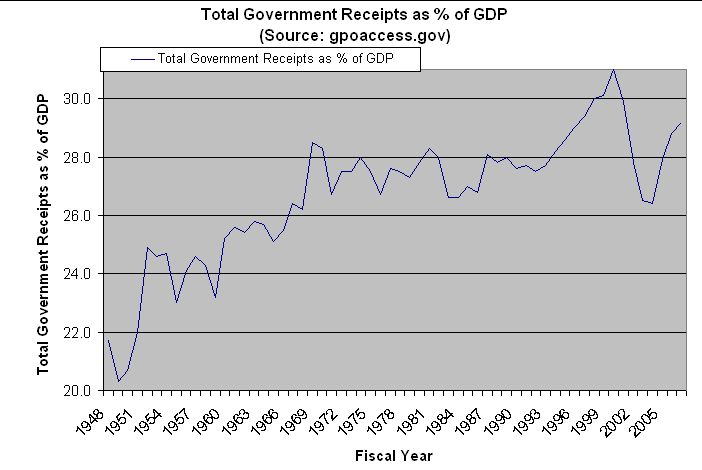 From 2001 through 2007, however, total government expenditures have once again grown consistently. The fact that government expenses have grown throughout US history is hardly ever acknowledged or even mentioned in media outlets or by the responsible authorities. This is not surprising. For once one acknowledges it, the age-old myths about neo-liberalism, free markets on steroids, anarchy, merciless capitalism, or insufficient government funding would immediately be debunked and could no longer be utilized as convenient excuses by those in power.